The National Highways Authority of India (NHAI) has issued an official notification for the posts of Dy. Manager (Tech) in 2015. For more details read out NHAI notification. Education Qualification : Candidates should have Degree in Civil Engineering from any recognized University. Selection process: Only GATE-2015 scores/marks valid. Based on this score candidates will call for the interview. No previous GATE score/marks will be valid. 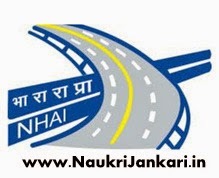 0 comments for " NHAI Recruitment 2015 for Dy. Manager (Tech) post "